With hundreds of products and treatments in the market claiming to bring back the skin you once had, I am very careful in what I apply on my skin and what ingredients it has. I believe in preserving and maintaining the best form of what I have, that has been my goal since I started taking my skin care seriously. It is easy for anyone to get caught in all the hype and marketing unless you believe someone for their word of advice, maybe a person or a brand. 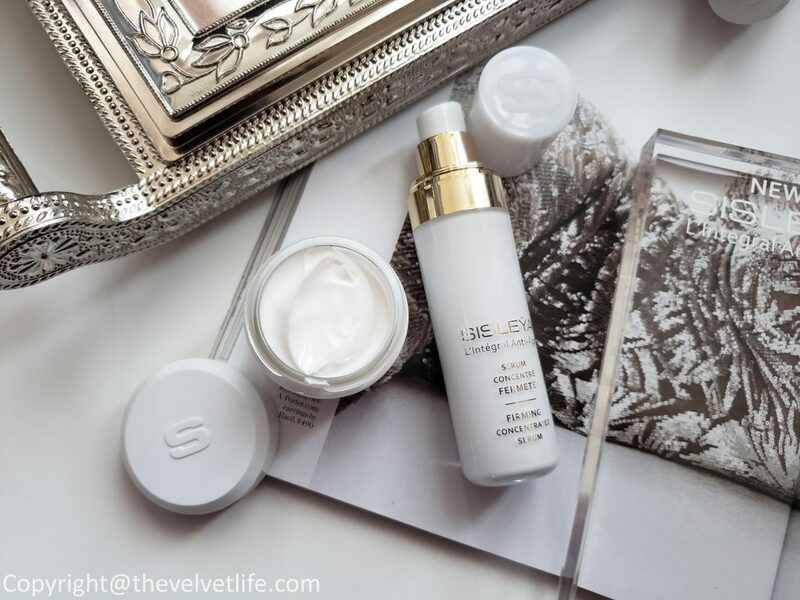 Sisley Paris is one of the brands I always look forward to, to their vision, to their ideology, the passion in the way they look at the skin concerns and the research and implementation of the outcomes from the results to give the best of anything you are looking for. With fall already here and winter approaching soon, not just the season but as I approach my mid-30s next year, I am more and more interested in keeping the products, which give me results, in the rotation. 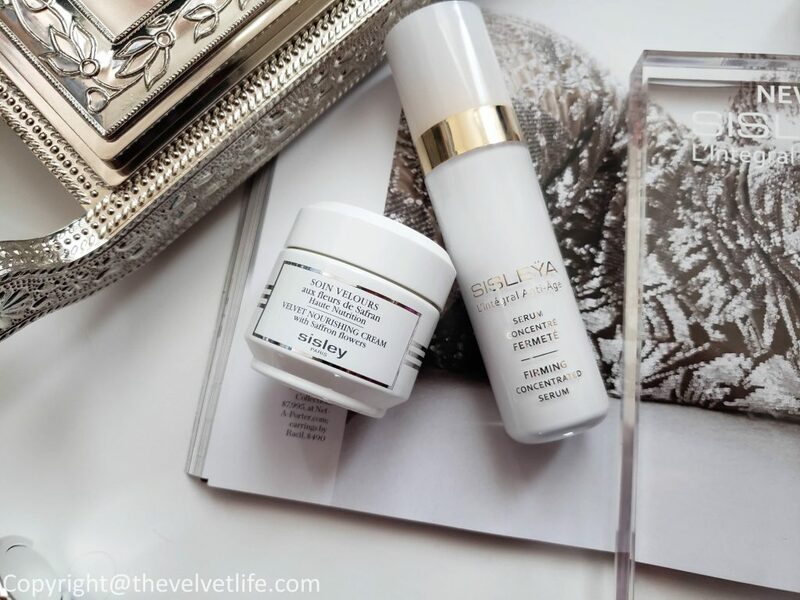 Finding the right product is the first concern, so I have been testing these two new launches from Sisley Paris since July this year, called Sisley Paris Velvet Nourishing Cream With Saffron Flowers and Sisley Paris L’Integral Anti-Age Firming Concentrated Serum. 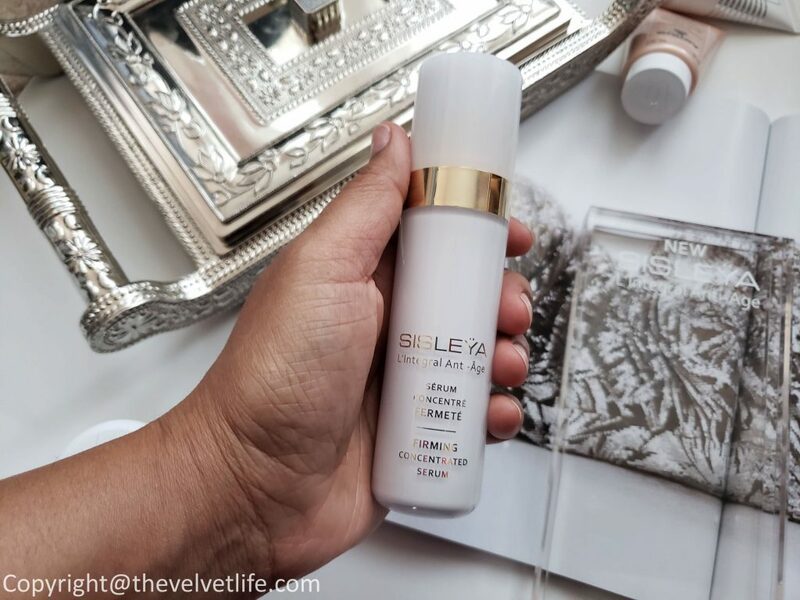 To give you a little background, Sisley launched Sisleya Global Firming Serum ten years ago, to provide a total solution for women experiencing loss of firmness. 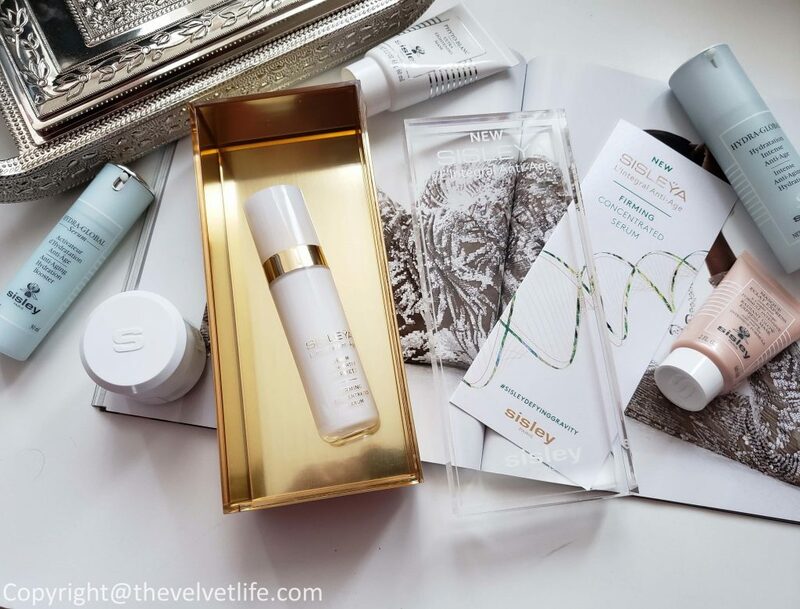 In 2016, Sisley introduced Sisleya Anti-Age, focused on the impact of epigenetic factors on aging, which refers to the significant influence our lifestyles and individual environments have on the visible signs of skin aging. This entire line is formulated with a combination of unique, key ingredients including Persian Acacia and Lindera extracts and a Soy and Yeast protein complex, for a comprehensive solution to address the visible signs of behavioral aging. In 2018, Sisley has gone even further in its study of epigenetics, exploring the very origin of behavioral aging at the cellular level. Sisleya L’Integral Anti-Age Firming Concentrated Serum provides a firming effect by wakening elastin production at its origin and acting on all structural levels of the dermis to restore skin tension. Elastin synthesis is revived, leading to firmer, denser, and more toned skin. Tension forces are reactivated and the firmness and shape of younger skin are restored to the face. 1. The awakening of the skin’s firming potential In addition to the inescapable effects of aging, lifestyle directly affects the proper functioning of elastin, which is responsible for the skin’s firmness. Sweet Marjoram extract, a new Sisley key ingredient, supports the awakening and boosting of the skin’s firming potential. Skin is visibly more firm, dense and toned in appearance. 2. Re-tensioning of the look of the skin Marking the passing of time, loss of firmness is also the result of the weakening of the skin’s tensional forces. Phyto-complex Pro-Firm 7, a unique complex with 7 powerful plant-based extracts, acts to promote the look of re-tensioning of the skin -> A true skin architect, Sisleÿa L’Integral Anti-Age Firming Concentrated Serum offers visible firming support and creates the look and shape of the more youthful skin. Application – ‘Apply morning and evening to clean, dry skin on the face and neck by massaging gently until fully absorbed. My thoughts – With combination skin prone to congestion, most of the anti-aging products at some point are too rich for my already extra-oil-producing skin. My experience with anti-aging products is that for a few days, my skin looks and feels better but as I use it more, my skin starts getting oilier and hence breakouts. It may not be the case with you if you have other skin type or even combination skin like mine. 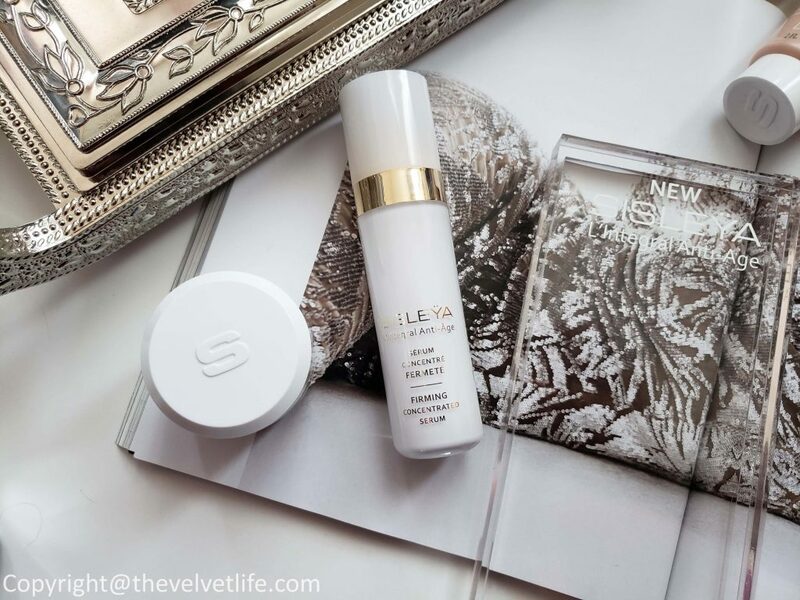 With Sisleya L’Integral Anti-Age Firming Concentrated Serum, I have been incorporating it for over two months in my skincare routine and really feel something is getting better from within my skin. I use this as my main treatment serum either after pre-serum or just after toning my skin. It has a lightweight creamy texture, not runny. It spreads nicely on the skin and absorbs quickly without leaving any residue or oiliness. My skin feels tighter, tighter in the sense of comfortable yet tighter and lifted. My skin looks smooth, plump, and fresh. It is not something like I see the results next day, glowing and plumped, but as with the powerful botanical extracts and other ingredients, they work in synchronization to start treating the skin from the small scale to show the results on overall skin with time and to preserve the effects on the skin for longer time while using the serum. 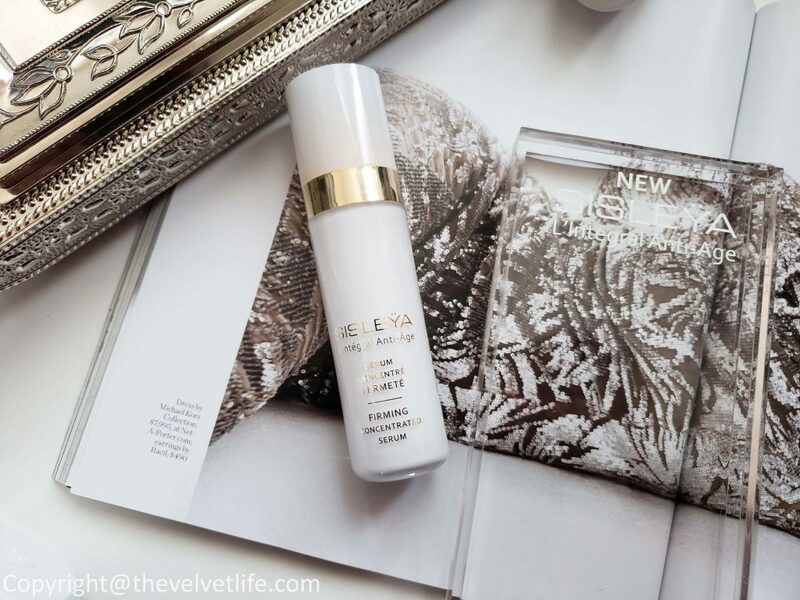 If you are looking for some serious anti-aging or just starting taking care of your skin, I would advise you to check Sisleya L’Integral Anti-Age Firming Concentrated Serum. To give a little background about it, Sisley has included two face creams in its Comfort Extreme range to rescue dry to the very dry skin in the last 15 years. This fall, Sisley’s Research has combined this duo to create an entirely new formula capable of protecting by day when skin is exposed to oxidative stress caused by UV rays and pollution and repairing by night while targetting all of the factors that contribute to skin dryness. 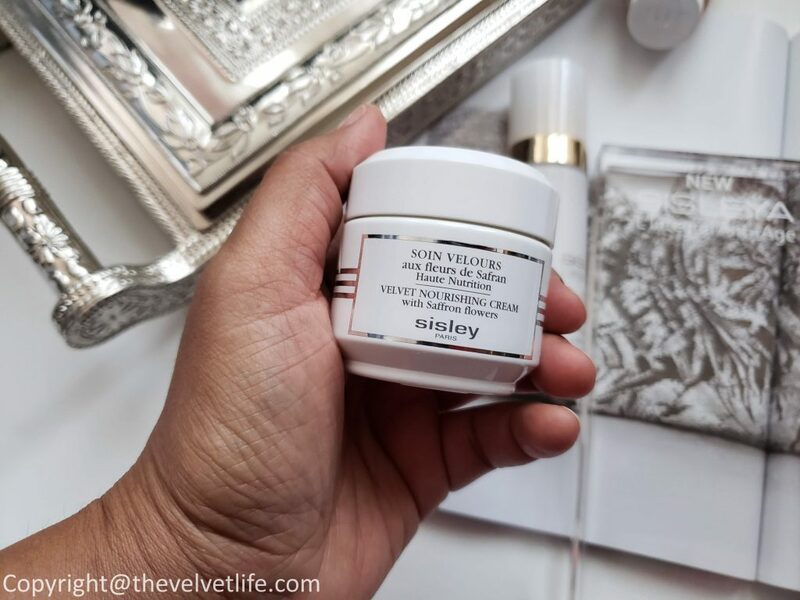 Sisley Paris Velvet Nourishing Cream With Saffron Flowers has rich yet soft, melting texture, relieves the feelings of tightness, reduces the redness, and revives radiance. It helps restore the lipidic balance of the dry skin, quenching the skin on the surface and reducing the water loss. The dry skin is nourished, hydrated, and protected against external aggressors that weaken and prematurely damage dry skin. I have known the benefits of Saffron since I was very young and in India, my father used the get the highest quality of saffron from the area near the Himalayas. Saffron was called a very precious herb used for a number of health benefits, I still sometimes boil the saffron threads in milk and drink, it is a source of energy as well as wellbeing. For the skin, it provides a cocooning effect that instantly relieves feelings of tightness and discomfort. Velvet Nourishing Cream With Saffron Flowers also has a combination of three oils rich in omega 6,7, and 9 to compensate for the absence of lipids in the dry skin as well as in the fall and winter, then the skin needs more care and nourishment. Cottonseed oil, Macadamia oil, and sunflower seed oil bring suppleness and comfort to the skin. The new active ingredient from Sisley called Japanese Lilyturf extract helps boosts skin’s barrier function. With some amazing ingredients, this moisturizer is an all in one you may need if you have dry skin or if you are looking for something that you can rely on during the fall and winter when a little extra is the need of the skin. My skin is a combination type and as fall is upon us, it was the perfect time to test this as I did not want the extra moisture during the summer but fall and winter, my skin is more dry than usual. The cream is true to its name, it is velvety soft and makes the skin like velvet, smooth and soft. I do not feel it as oily or greasy on the skin, even though it is for dry skin types, it does absorb into the skin instantly making the skin comfortable and nourished. My skin does look plump and radiant. I have not noticed any breakouts as I was more concerned about my skin breaking out when I am adding a new product into my skincare routine. It works great as a day cream or a night cream. During the day, it is a nice makeup base too, makeup stays in place all day. Half of the skin’s concerns are resolved and blurred if the skin is hydrated, and if the moisturizer is a good one, you just need that one thing in your skincare routine that makes the other products work well, this is that kind of product.